Local stalwarts of the SHS Class of 1946 gather again for their annual reunion. Counter-clockwise from the right: Margaret Matuck, Debbie Dion (of a much younger class, but attending to assist her mother alongside), Shirley Barnett Harrison, Bob Sheldon, Doris Church Clark, Chet Kuras, Dorothy Paganelli DeForge, and Mary Anne Zak (an invited guest from the Class of ‘46 in a Baltimore high school). The empty chair was soon occupied by Jeanne Bailey Webster, who arrived a bit late. The Suffield High School Class of 1946 was among the first classes that spent all four years in Suffield’s first high school (now McAlister Intermediate School). 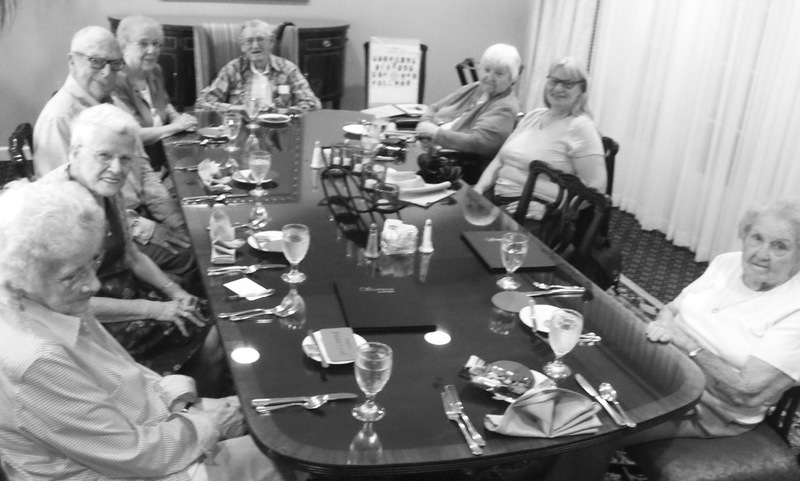 A surprising number of the Class of ’46 live hereabouts, and they’ve been meeting annually for many years, lately through the efforts of original class secretary Dorothy DeForge. Eight were able to attend the luncheon on June 29 in the private dining room at Suffield by the River; two more in nearby towns weren’t able to come; and four more live elsewhere in the country. That’s an impressive one third of the original 42 in the class. Must be that good Suffield soil. The group has decided to meet more casually about every three months, still at Suffield by the River. Dorothy said the Suffield Mini-Bus will be a great help.